Age spots and brown spots (also known as sun spots, liver spots, lentigines, dark spots, etc.) are a consequence of aging and sun exposure. 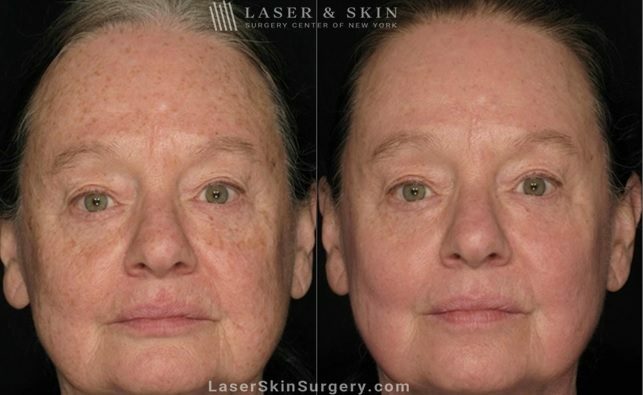 The most effective and rapid treatment for eliminating these spots and other skin pigmentation is laser therapy. We have numerous laser options that allow us to customize treatments for each patient. Some of the most effective lasers include the Ruby laser, nd:YAG laser, and the Fraxel Re:store Dual laser. Dr. Roy Geronemus recently described treatment using the Ruby laser for brown spots in Oprah magazine. "You'll get a scab that fades away over a couple of weeks and leaves clear skin behind," says Roy Geronemus, MD, clinical professor of Dermatology at NYU Medical Center. "One to three treatments are necessary, depending on the number of spots to be treated."